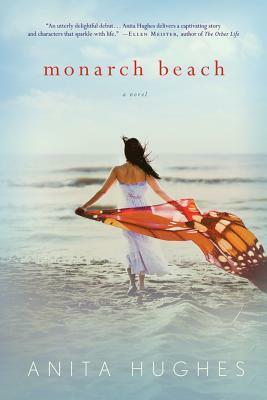 If you are looking for a quick vacation read, then look no further than Monarch Beach by Anita Hughes. It's available today: Everyone say HAPPY PUB DAY, Anita! (tweet this). I read this book in about 3 or 4 days and the whole time wished I was sipping a Flirtini on the deck of a cruise ship (Cruises are my preferred vacation). I loved Anita's writing style. It just flowed so easily. As I've mentioned before I am no fashionista and so found the heavily label dropping of clothing designers a bit funny. However, they did play a part in developing the character of Amanda and setting of the story. Amanda had dreams of becoming a fashion designer until she was swept off her feet by a French chef who knew his way around a woman. Whether it was a culture difference or just his excuse, Andre saw nothing wrong with continuing his acquaintance with the various female staff at his restaurant. Fortunately for Amanda, she's the heiress and member of San Francisco high society. 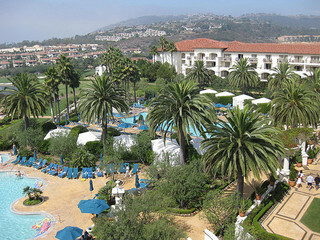 I'm sure every woman who has had to face a cheating husband and divorce wish the could whisk away to St. Regis Monarch Beach, where they are waited on hand and foot by a personal butler, daily 6pm cocktail hour, a party every evening, and a Kid's Club that entertains the children all day. Amanda spends the summer getting fit, tan, and discovering what she wants in life. I have to admit I had a bit of trouble with the story itself. I didn't feel there was enough conflict with Andre and the divorce. I get that divorce may not be as messy or difficult when you have buckets of money, but since Andre doesn't want the divorce I figured there would still be more conflict about custody. I also did not feel there was really much internal conflict for Amanda either. Aside from wishing there was a bit more conflict in the plot, I enjoyed the book and look forward to the next story from Anita Hughes (there's a sneak peek at the end of Monarch Beach). If you are a Lifestyles of the Rich and Famous fan, on vacation, and like great writing, then pack a copy of Monarch Beach in your beach bag. Your Turn: What/Who are some of your favorite vacation books/authors?